Cloud infrastructure providers attracted acquisitive suitors last year. Profitable cloud vendors this year will catch the eye of telecoms. Companies specializing in cloud computing infrastructure technologies were attractive acquisition targets in 2011, according to a report. In fact, interest in acquiring such companies has been growing exponentially over the past three years. In 2009, independent investment bank Berkery Noyes tracked 63 deals in this market segment; this increased to 114 in 2010 and again grew to 209 in 2011. 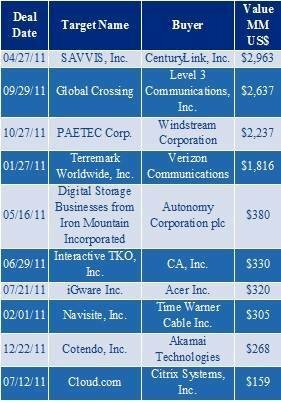 The total amount of money spent on acquiring these companies reached $15 billion last year. Three technology trends primarily drove interest in cloud infrastructure companies over the past year, according to Berkery, including virtualization software, bandwidth and, of course, security. “Security is what gives people the warm and fuzzies and makes them feel more comfortable about allowing their infrastructure to go out of house,” he said. Security is what gives people the warm and fuzzies and makes them feel more comfortable about allowing their infrastructure to go out of house. Another trend driving heightened interest in cloud infrastructure companies is the fact that both users and vendors lean more heavily toward converting from licensed software to selling or buying software through cloud-based subscriptions. Vendors like it because it gives them a more dependable revenue stream; users like it because it frees them from the complex licensing deals that accompany packaged software. In fact, this trend inspired some of the largest deals of 2011, and should continue throughout 2012. “Going into 2012, more businesses will seek to convert from owning and maintaining licensed software to utilizing subscription-based cloud solutions,” Christopher Young, managing director of Berkery Noyes, said. “Two of the largest software deals in 2011 -- SAP’s acquisition of SuccessFactors and Oracle’s acquisition of RightNow Technologies -- demonstrate an ongoing interest in integrating enterprise applications with the cloud.” Figure 1 shows the top 10 notable transactions of 2011, according to the company. And telecom providers show a growing interest in buying their way into the hot cloud services market action, as reflected in the bank’s list of biggest dollar deals of 2011. Topping the list were three telecom deals: Century Link’s $2.69 billion purchase of Savvis, the $2.63 Level 3 Communications deal to buy Global Crossing and the $1.8 billion Verizon Communications plunked down to acquire Terremark Worldwide. This flurry may be only the beginning of such deals, which may see telecom providers give others vendors looking to enter the cloud services business a run for their money over the next three to five years.